The NFL isn't exactly short of controversy, both on and off the field. Their decision to stop teams from posting in game videos or GIFs on social media hasn't brought them much love, and some teams haven't exactly been shy in expressing how they really feel about it. Last week the Carolina Panthers tweeted about a pass from Derek Anderson to Kelvin Benjamin with "AndersonToBenjamin.gif". Although the tweet was later deleted, the sentiment was clear. 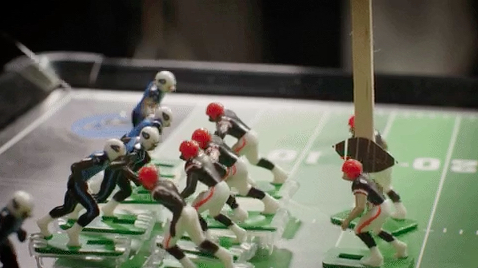 During last Sunday's games, both the Cleveland Browns and the Philadelphia Eagles tweeted 'highlight' GIFs using toys and stop-motion animation. The reason the NFL are doing this relates to their digital strategy outline, and the fact that they're signing a lot of lucrative deals with social media platforms for promotion. For this reason, they would rather that all the in-game content was coming from their channels. From their point of view, teams posting similar content is just going to hurt their figures. Put that way, you can understand why they would want to limit team posting during games, but extending it all the way to GIFs is the part which is causing teams to bite back. There has to be some level of compromise, and as much as the NFL are well within their rights to want game day content to go through their channels, the individual teams and players deserve a little bit of wiggle room.